This is another photo my grandmother had in her files. I believe it’s The Guernsey Cow circa post World War II. 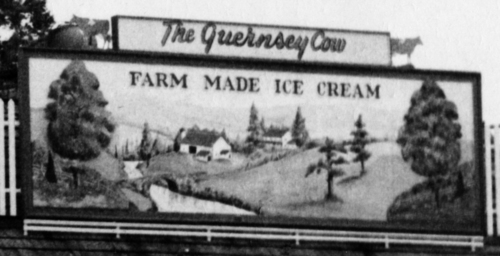 That’s when my grandfather changed the name of the business from The Exton Dairy Grille to The Guernsey Cow. I really like the detail of this pastoral scene atop the roof. I don’t know if it was painted from an actual Chester County scene or a creation of Pottstown sign-painter Harry Reed’s. I also wonder how it fared in harsh winter and summer storms — especially the twin cows standing watch on either side of “The Guernsey Cow” board. Previous Previous post: Thanks All!